Former Berkeley Patients Group employee and longtime East Bay activist Debby Goldsberry provides an eyewitness account of the first-ever raid at Amsterdam's High Times Cannabis Cup this year. 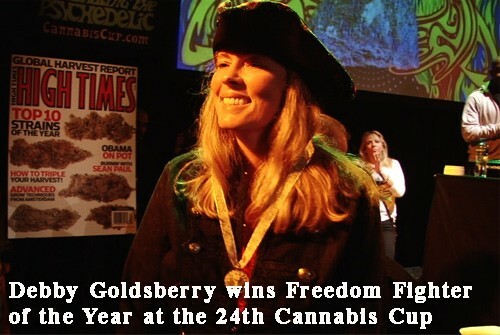 Goldsberry came to Amsterdam — where pot is decriminalized but not legal — to judge the Cup's indicas and receive the High Times Freedom Fighter of the Year Award. But after the raid kicked off, local police harassed organizers over the course of three days — though in a distinctly Dutch fashion.
" ... these were the most mellow cops ever ... The police did not seem to mind that hundreds of people were blazing joints all around them. Some even seemed to be smiling with contact highs. Passing joints around fast and debating the merits of samples 21, 20, 17, and 12, while surrounded by 200 cops and tax collectors actually became fun."